By providing a secure, distributed, renewable, and reliable infrastructure for the dissemination of HDCP blacklisted device lists. By providing secure means for enforcing rogue device revocation on OTT devices capable of producing HDCP output. - a cloud-based service which maintain a HDCP blacklisted devices list. The CCF function is able to recover from the HDCP transmitter the complete HDCP topology, and securely communicate the HDCP ID's in use to the DRM stack. The DRM stack is updated of blacklisted ID's by the cloud-based service, and is able to react if a blacklisted device is involved. Depending on the distributors and contents to play, the way to react could be: to add an overlay banner on the screen; to downgrade the quality; to do both; or to simply stop the playback. Premium content owner or distributor is faced with HDCP rippers and the benefits/loss associated with it. 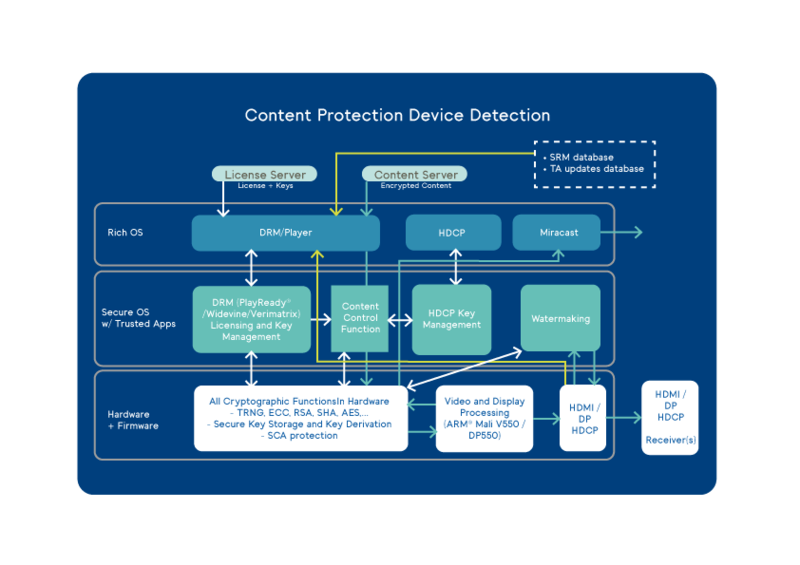 Content Protection device detection is an advanced CCF trusted application embedded in a TEE - several TEE pre-integrated - able to communicate with the HDCP receiver and then recover a complete HDCP topology to securely share with the DRM stack. Each HDCP receiver has its own receiver ID, and main stakeholders such as OTT, content providers, movie studios or DCP LLC are scanning the market to maintain their own HDCP blacklist. Content Protection device detection cloud service is aggregating all these sources to deliver the most up-to-date blacklist to the DRM stack, through the DRM license acquisition process, and allow the most secure way to ensure premium content playback on an authorized system. Major DRM system vendors are involved to facilitate the integration and use of this new secure feature.